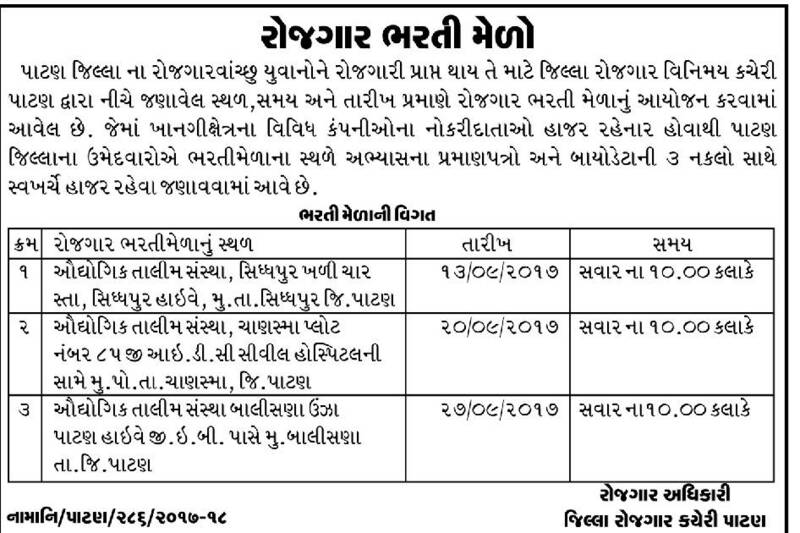 Employment and Training Department, Patan “Rozgaar Bharti Mela” Employment and Training Department, Employment and Training Department, Patan “Rozgaar Bharti Mela” 2017 : Employment and Training Department,Patan has released an employment notification inviting candidates to apply for the positions of below mentioned posts.This is a great chance for interested candidates who are looking for Jobs in Gujarat.The Rozgaar Bharti Mela held on September 2017.more detailed information regarding educational qualification,age limit,selection procedure,how to apply ,last date for Employment and Training Department, Patan “Rozgaar Bharti Mela” are mentioned below. Educational Qualification: Please read official notification for educational qualification. How to Apply Patan Rozgaar Bharti Mela ? Eligible candidates may attend the interview along with bio data, original certificates to given below address.